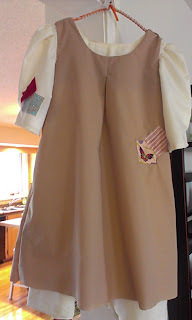 I was cleaning up my sewing room this week after a flurry of costume and curtain making last week. I came across a bag of blocks that I had made two years ago. I had put it away because I sewed all the blocks backwards from what the pattern said. I didn't have the heart to or the brain power continue, so I put it away. This week when I came across the bag deep in my stash, I recalled why it was there, grimaced and pulled out a few blocks. I knew it could go together somehow, just not the way the pattern layout indicated. I just placed the blocks differently and it went together nicely. Easy Peasy. In the original pattern by Kim Shaefer, the pinwheels spin the other way. So this is setting on my bed, and I'll make some setting triangles, sew the blocks together, add some borders, and voila, a scrappy quilt top is done. I really like how the blocks are nothing like what the pattern turns out to be. Want to take a "Beyond Stippling" Class? 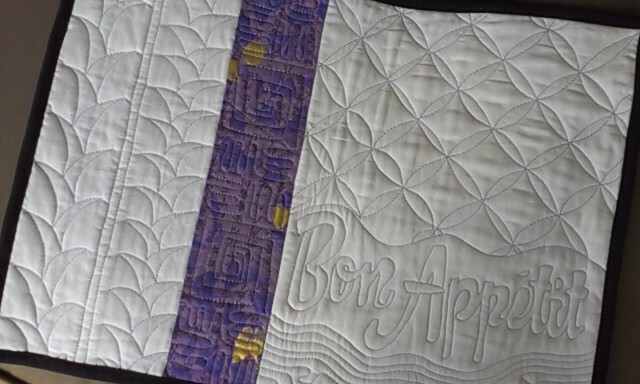 Want to do learn a few new free motion techniques so you can quilt your own small projects? I'm teaching a "Beyond Stippling" free motion quilting class at the Sussex Quilt Guild on Tuesday May 9th. There's room in the this class if you would like to travel with me. I can take two quilters (and machines) with me from Freddy Beach to Sussex. Contact me and I'll give you all the details. 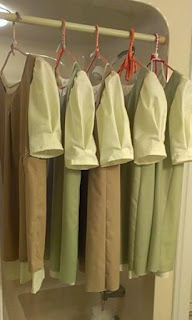 I've been working all week on finishing these 5 little orphan costumes, for Grace's Dance team. Since this picture was taken, the little "poor" patches have been applied to the dress fronts, sleeves, and a patch for the back area. And they've been hemmed and are ready for dance class tonight. I hope to get a picture of the kids wearing them this week or next week so you can see how cute these little dancers are. Note: Just got this picture of the little dancers practicing in their new costumes. Cute, eh! 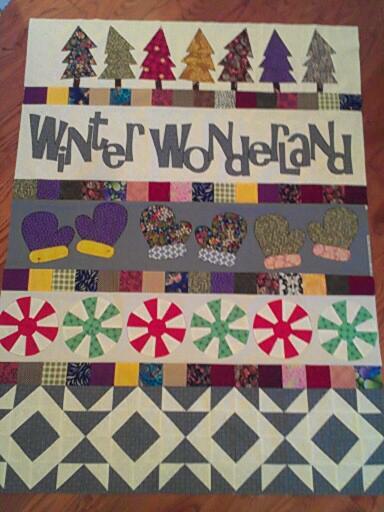 Winter Wonderland Row Quilt - Top done. 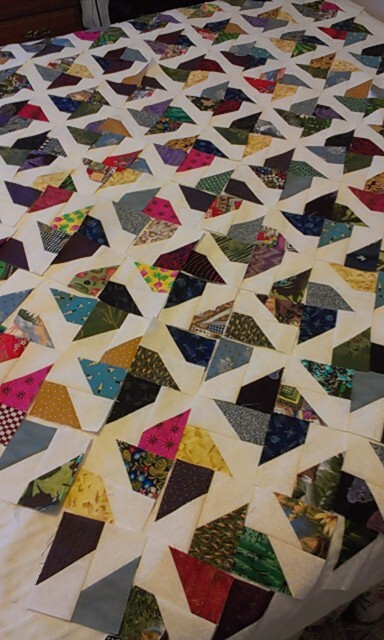 At the Cotton Mill Guild last fall, we started working on this row quilt. We were given a row each month and while I was south, we were given the last set of instructions to finish up the cute design. The pattern is a free pattern designed by Natalia Bonner from Piece 'n Quilt and posted here on the Riley Blake Blog. I had kept up every month with the rows, and loved that I used only scraps from my stash to make this quilt. It's like it cost me nothing!! 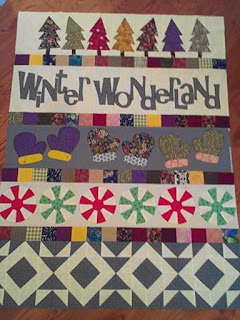 And I like the fact that not one of the scraps was Christmas or Winter fabric. This afternoon, while cleaning up my sewing room, I came upon all my completed rows. Well, it didn't take more than 20 minutes to sew all the rows together. I like it. I think I'll audition a couple of colors for a small border. My plan will be and do some simple free motion quilting to finish it before our next guild meeting, in 3 weeks. There is a prize drawing for all those who bring in the finished top. 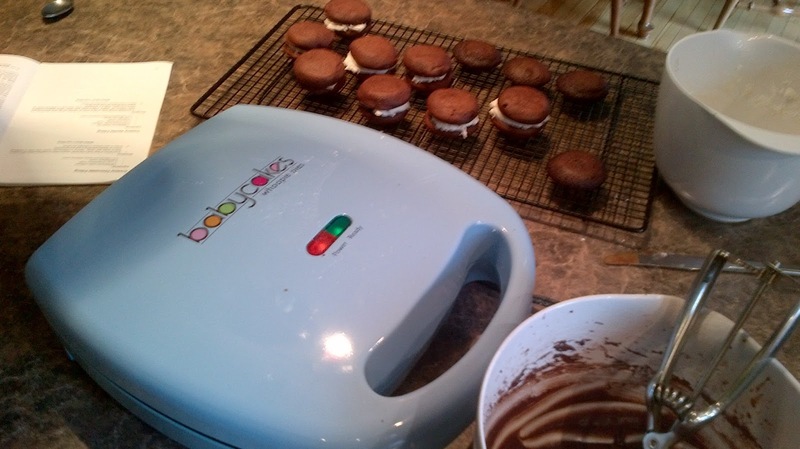 Whoopie Pies. This was our first time making them. I have to tell you, they were so much fun to make with kids. I used to see giant whoopie pies in the cafeteria where I worked, but would never dream of eating one. Can you just imagine the calories in them. I bought this little babycakes whoopee pie maker home with me from down south. It makes nice reasonable size ones. Grace and Aurora absolutely loved making them. 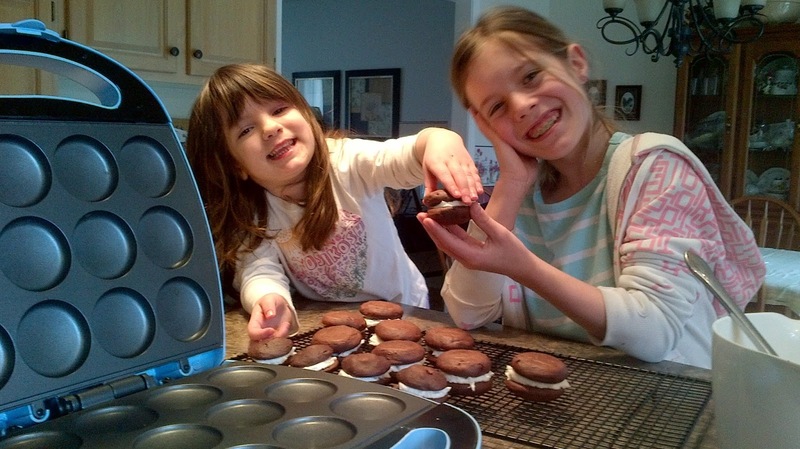 Of course, some whoopie pies were sent home with the kids so others could enjoy them too. 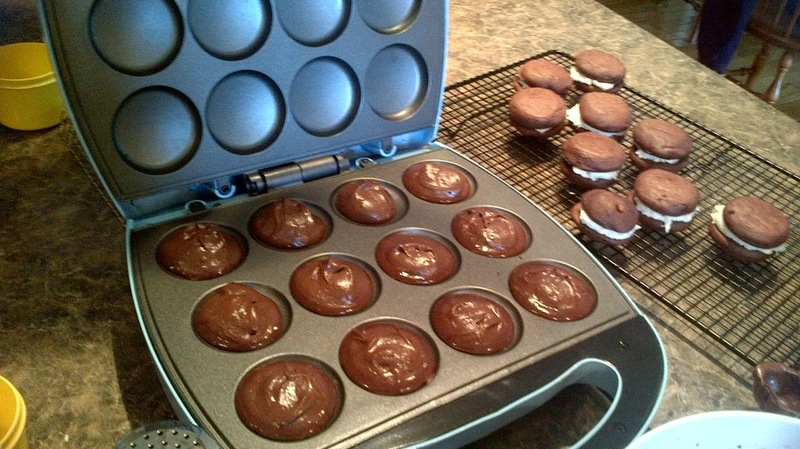 We used a recipe that came with the babycakes machine, but the batch was very small. It made about 10 cookies. I had to make a second batch so we could sample and send some home with the kids. I would double or triple it next time. 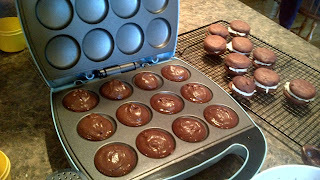 Or I might even try Wilton's Whoopie Pie recipe. It's slightly different. 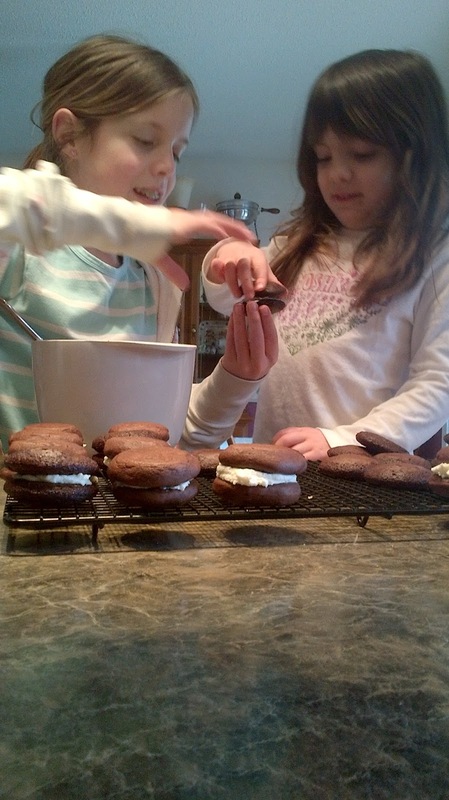 Our assembly line had me operating the hot whoopie pie maker, Grace put yummy icing on one side of one cookie, and Aurora put the other cookie on the top and gave a little squish. A perfect team wouldn't you say. 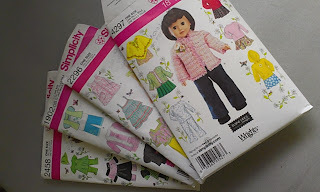 Simplicity Patterns for 18" dolls. Aurora has a Journey Girl, and Grace and Caitlin each have an American Girl. They are very similar in size. A couple of months ago I bought these doll clothes patterns and with Aurora visiting this weekend, it was time to try out a couple of the patterns. It was fun project for us. The patterns are as complicated a making full size clothes, but they really do turn out cute, and are a good fit. Grace is part part of a dance team. They're dancing in Halifax competitions early next month. 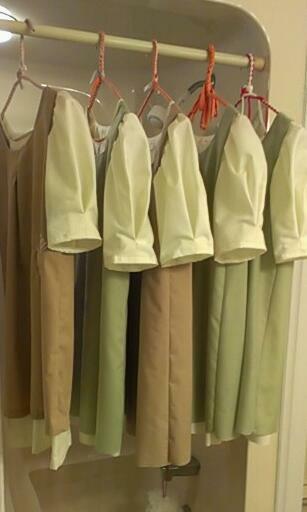 The 5 girl team needs orphan costumes which are very hard to find. So, I'm helping them out by making the costumes. It consists of a light colored under dress and a smock over it with patches. I have one of the costumes done. I'll see how it fits, and make adjustments then make the other four this and next week. They're going to be cute. I've been back from down south for a week. It's been a fun, but its been a busy week. I'm getting back into the groove of things. Aurora is visiting this weekend. We're making doll clothes as well as a couple of roman blinds for her mama. I knew this day was coming, but it took me by surprise. 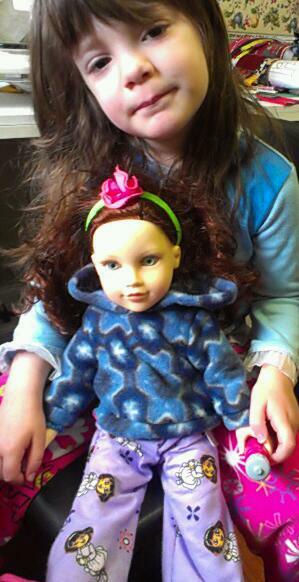 Today she says, "Grammie, I want to sew!" And she wanted to sew NOW. So I talk to her about sewing, and yes she can sew. 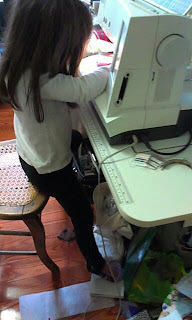 I choose my Pfaff to let her sew, because it has a 'sew slow' button on it. I tell her that. She chooses fabric, and sews. She's kind of a natural at it. For now, she just straight lines on really nice Dora fabric. She knows how to put the presser foot up and down to turn the fabric. She manages to sew even slower by having a light foot. All this made me smile.